Through A Different Lens is a teacher led project sponsored by the Vancouver Foundation. This project involves teachers from K-12 who are focusing on alternative methods of instruction and assessment to help all students succeed. 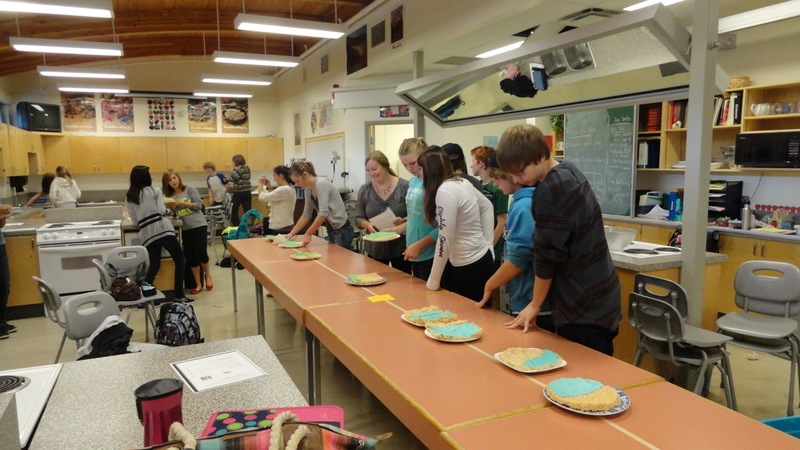 I had thought about doing a foods lab before, but it never came to fruition until this year. We decided to make Rice Krispies squares because it is a simple recipe and the cost of the ingredients were not too expensive. The icing was made before class (two different colours to represent positive and negative rational numbers) the butter was pre-cut into tablespoon blocks. Students were placed in groups of 4 in order to participate in the lab. Each group was responsible for representing one positive and one negative rational number. Teams were given one square 9”x9” pan and one similar sized circular pan to use to represent each of the groups’ assigned rational numbers. Basically there are 5 components to this lab: 1. Paper Assignment 2. Making the Rice Krispies and dividing the product evenly into one square pan and one circular pan 3. Dividing each pan into the appropriate parts to represent the two different rational numbers. 4. Each group then placed the two rational number representations on the large class number line in the appropriate location. 5. The exercise concluded with a class discussion and review of the final number line. “I liked it because it showed how it (rational numbers) relates to real life”. 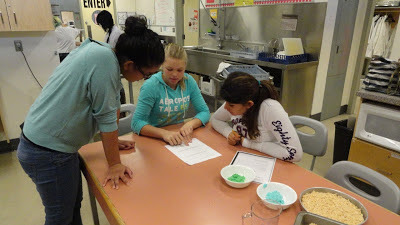 “I liked the foods lab because it was a learning hands-on activity. It was cool to see the big number line and where all the Rice Krispies squares fit on it. It was a nice break from the textbook, and it was helpful to visualize”. “It was yummy and fun! It was a good way to work with other students”. My conclusions: The food lab was a worthwhile departure from a regular lesson because it engaged students in learning about rational numbers in a dynamic and meaningful way. The exercise fostered communication within groups and between groups resulting in as deeper understanding of the concepts. Since most (if not all) of the students enjoyed the lesson I would definitely try the food lab again. This blog is a collection of the work that K-12 teachers in our district are doing in a project called Through A Different Lens. The focus is on innovative teaching and assessment practices and the impact these have on our students at risk of not completing school. This district blog is made up of posts taken from the personal blogs of each teacher in our group. Because it is a public blog, any specific references to students are removed. We are attempting to collect a wide range of posts (everything from specific instructional or assessment strategies teachers have tried, to philosophical questions they are struggling with, to strategies they have found effective for working with students at-risk). Our intention is that this blog will truly be a collaborative experience with the best ideas, reflections, and efforts of educators from K-12, across many subject areas. Subscribe To "A Different Lens"